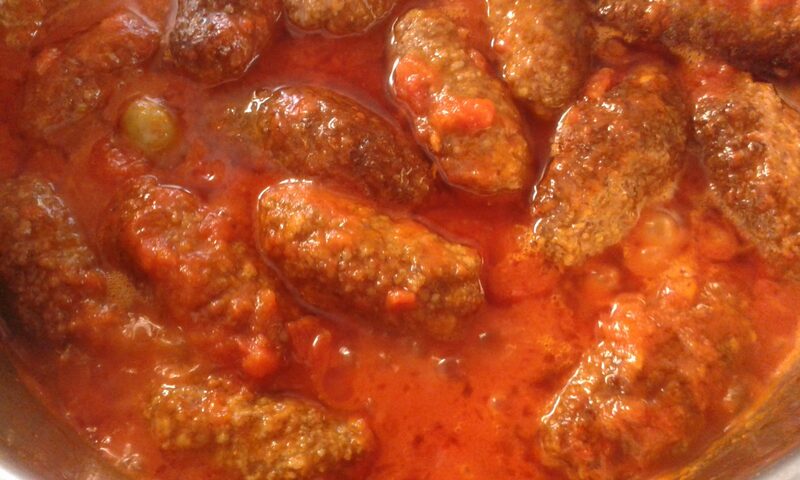 It is one of the most delicious Greek dishes with ground meat: Soutzoukakia Smyrneika Σουτζουκάκια Σμυρνέϊκα or simply Smyrna Meatballs. They are flavored with cumin and garlic, fried and then simmered in tomato-wine sauce. 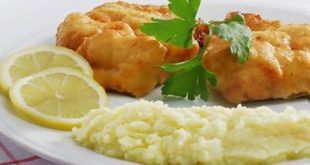 Greek refugees from Asia Minor introduced the dish to the Greek cuisine after the 1920 and became one of the most favorable dishes. The dish is easy to prepare and quick to be cooked. Soutzoukakia are traditionally made of ground beef with cumin, garlic, salt and pepper. They first get fried and then added to the tomato sauce. Alternatively one can bake them in the oven for about 1 hour or grill them for 10-15 minutes. In both cases, one has to brush them with olive oil. Attention is needed with the cumin as it can turn Soutzoukakia into “cumin-bombs.” I have found out that freshly opened ground cumin sacket has a much stronger flavor that the one you have in the pantry for a month or so. I once used the same amount – 1 teaspoon – but I had to throw the meatballs away after I fried them. They were extremely cumin-us and bitter. For the tomato sauce one can use fresh tomatoes, half a kilo. 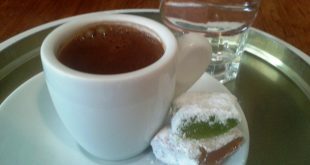 I use the authentic Soutzoukakia recipe my grandmother brought from Smyrna when she came to Athens with her own mom, her brothers and sisters, relatives and friends and a million of other refugees in September 1920. 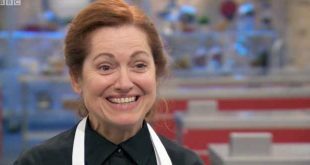 She never used onions in this recipe, neither in the meatballs or the tomato sauce but a handful of olives instead. 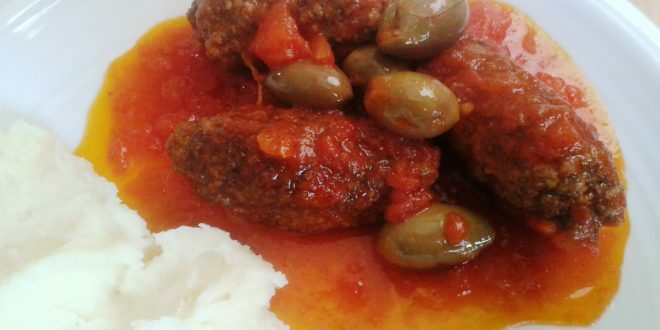 The average Soutzoukakia recipe includes no olives but maybe grandma used them as a reminder of their previous life in a village at the Turkish coast. They were farmers with olive groves and grapes (raisins) yards. Also no dusting the meatballs with flour before frying. My grandma used to say that flour absorbs more oil. Go figure! Over the years, when my mother took over the kitchen duties, wine was added in the tomato sauce. Green crashed olives pass best as they are slightly bitter. I suppose one can also use black olives or omit them all together. Soak bread slices in tab water for 5 minutes, drain, squeeze the water out and make bread crumbs. In a large bowl mix the ground beef with bread crumbs, cumin, salt, pepper and the egg. Knead well. Set aside to rest for 10 minutes. 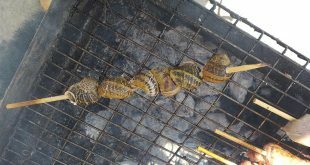 Take pieces of the meat mass and shape them into oval forms some 6-7 cm long. Half kilo of minced meat makes 20 meatballs. Heat the olive oil in a pan and add half of the meatballs, when oil has reached proper temperature. Once their down side is fried, turn them over and fry until brown. Place on kitchen paper to have additional oil absorbed. Crash the tomatoes including the juice into a multi-mixer. In a big flat saucepan add olive oil, tomatoes, salt, sugar, water and a bit of dry oregano. When the sauce begins to boil, lower heat and let it simmer for some 15 minutes. When ready add the olives and the wine. Let the wine evaporate, close the top and let simmer again for 5 minutes. Place the meatballs into the tomato sauce and allow the whole mixture simmer on lowest heat for 10-15 minutes. 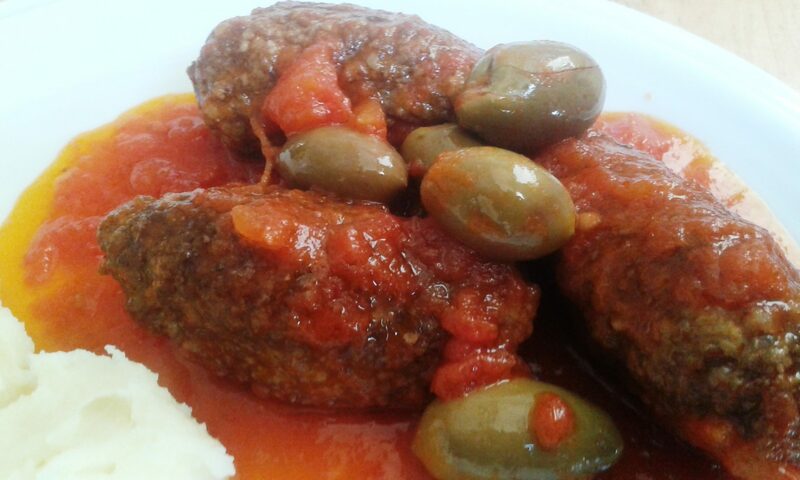 Smyrna Meatballs Soutzoukakia are traditionally served with mashed potatoes or rice. Those who are not lazy, serve them also with French Fries from scratch – of course.